On the evening of February 28th, Longgang district government held a spring party to reward investors and enterprises that have done great contributions to the social and economic development of the district in the past 2010. 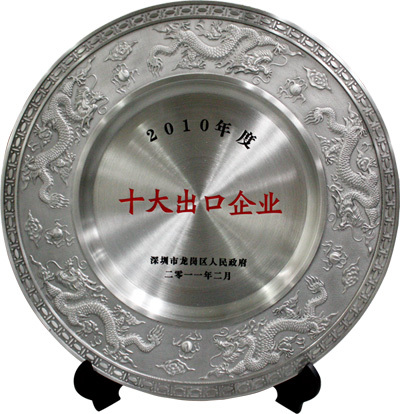 On the party, a total of ten enterprises like KTC and Guangdong Nuclear Power Company were granted the honor of Top Ten Exporters in 2010 by the Longgang government. In 2010, our company has attracted more and more professional buyers and builds up a high-end image in the industry by participations in exhibitions like Canton Fair, Hong Kong Electronics Fair, Dubai GITEX, which has greatly boosted our business development and foreign trade. It’s learnt that our export performance has regained dynamic momentum since our participation in Canton Fair and Hong Kong Electronics Fair in Mid-April, 2010. In 2011, we will keep on the track of fast development and boost the export performance to a new level by means like diversification of moulds and enhancement in client development. It’s reported that this year, taking the great opportunity of Universiade and unification of Shenzhen special economic zone, Longgang district will focus on planning and constructing “two lines, five zones and ten industrial bases”, so as to enhance the urbanization and modernization of Longgang and speed up the construction of major infrastructure and industrial transformation & upgrade. This will provide better environment for KTC’s development and we should grasp this opportunity. Of course, the opportunity and challenge co-exist. We should enhance our R&D ability and core competitiveness, and expand the market to make another good harvest in this year.